Saturday's strikes were the biggest intervention by Western countries against Syrian President Bashar al-Assad, whose ally Russia is facing further U.S. economic sanctions over its role in the conflict. "The catalyst had been the concern about trade issues, which is calming down. The bombing in Syria looks to be an event rather than an ongoing thing and it was a coalition," said Jeffrey Carbone, managing partner, Cornerstone Wealth, in Huntersville, North Carolina. "Now we get to concentrate on fundamentals," he said, adding that earnings season is beginning as economic data has shown an accelerating economy. The news flattened the spread between five- and 30-year Treasury bonds <US5US30=TWEB> to 34.6 basis points, the lowest in over 10 years. Expectations of further interest rate increases lifted the short end of the curve earlier in the day, led by the two-year government bond <US2YT=RR>, which hit 2.394, its highest since September 2008. 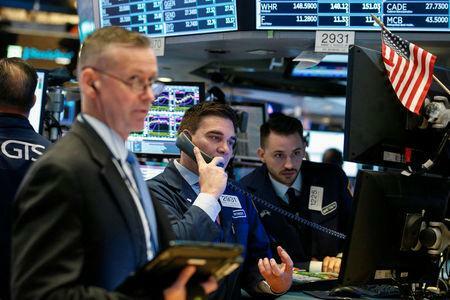 The Dow Jones Industrial Average <.DJI> rose 212.9 points, or 0.87 percent, to 24,573.04, the S&P 500 <.SPX> gained 21.54 points, or 0.81 percent, to 2,677.84 and the Nasdaq Composite <.IXIC> added 49.64 points, or 0.7 percent, to 7,156.29. The greenback fell 0.41 percent against a basket of major currencies <.DXY>, while the euro <EUR=> rose 0.4 percent to $1.2378. The pan-European FTSEurofirst 300 index <.FTEU3> lost 0.46 percent. MSCI's gauge of stocks across the globe <.MIWD00000PUS>, which tracks shares in 47 countries, gained 0.39 percent, though emerging market stocks dipped 0.58 percent. The yields on German <DE10YT=RR> and 10-year U.S. government <US10YT=RR> bonds, among the most liquid and safe assets in the world, touched their highest levels in nearly two weeks and four weeks, respectively. Some other traditional safe-haven bets held firmer, with gold <XAU=> and Japan's yen <JPY=> edging higher. Meanwhile, oil prices fell on waning investor concern about Syria. U.S. crude <CLcv1> fell 1.62 percent to $66.30 per barrel and Brent <LCOcv1> was last at $71.49, down 1.5 percent on the day. For Reuters' Live Markets blog on European and UK stock markets, open a news window on Reuters Eikon by pressing F9 and type in 'Live Markets' in the search bar.